Researchers into food and nutrition discover interesting facts about the food we buy and eat and update the food pyramid with this data on a regular basis. In addition to suggesting how we can eat better, dieticians spend much of their time exploring how we eat and what causes us to change our eating patterns. Some fascinating research into the Irish economy has just revealed that prosperity can damage our eating habits! In July 2010 the Journal of Nutrition published a report that claimed virtually the entire US population was eating a diet that bore no resemblance to the food pyramid. The study was undertaken by research teams from the National Cancer Institute and the USDA’s Center for Nutrition Policy and Promotion. They examined data from nearly 17,000 people across the USA using special modelling techniques that took variables such as weekend, age, gender and ethnicity into account. Most of the population of the USA who participated in the survey were failing to meet the recommendations for all nutrient groups except meat. In most cases this failure was of under consumption (of fruit, vegetables and pulses). 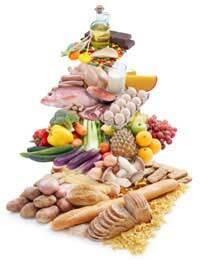 Over consumption of three classes of food – fats, sugars and alcohol, was commonplace. Over 80 percent of people who were seventy years old or above were exceeding the recommended calorie intakes. A whopping 90 percent of those aged two to seventy were eating empty calories that exceeded the recommended calorie allowances. These findings have been passed to the federal body that produces food pyramid information in the hope that more targeted work can be done to reach people who are over-consuming less healthy foods and under-consuming healthier ones.